Ready for the big game this weekend? While I’m not a huge football fan, I love watching the expensive commercials and snacking during the game. Thanks to the generosity of Cabot Creamery, I had several varieties of cheddar to play with for this crowd pleasing recipe. 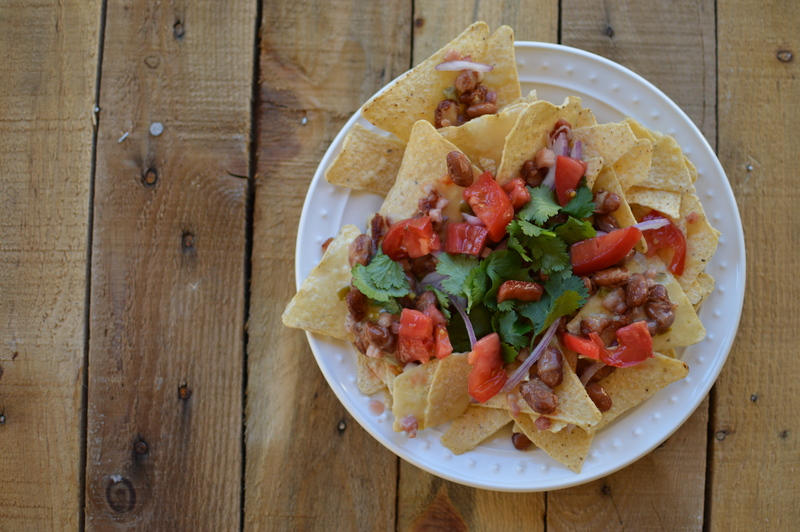 It’s a lightened up nacho recipe to serve at your next get together! It uses baked tortilla chips, which are 40% lower in fat than the regular restaurant kind, but this recipe doesn’t skimp on flavor! The combination of extra sharp cheddar with IPA and smoky ham more than makes up for the healthier corn chips. Using extra sharp cheddar in recipes is smart because it’s so tangy and cheesy that you can use less of it than you would a milder cheese and still get amazing depth of flavor. Cheddar cheese pairs well with hoppy IPA- the beer I chose for my cheese sauce! Bonus: you only use 1/2 a cup of the beer, so you can sip on the rest while you cook! 1. Preheat the oven to 350 degrees. Place the tortilla chips on a baking sheet lined with aluminum foil in the oven to warm. 2. Heat a nonstick skillet lightly misted with cooking spray over medium-high heat. Sauté the ham dices and pinto beans, stirring occasionally for 5 minutes or until golden and crispy. Set aside. 2. Bring 1/2 cup of beer to a simmer in a small saucepan over medium-high heat. 3. Whisk in the cheddar cheese and continue whisking until melted and incorporated. To thicken the cheese sauce, add 1/2 a teaspoon of cornstarch dissolved in 1 tablespoon of cold milk. Continue whisking until thickened. 4. 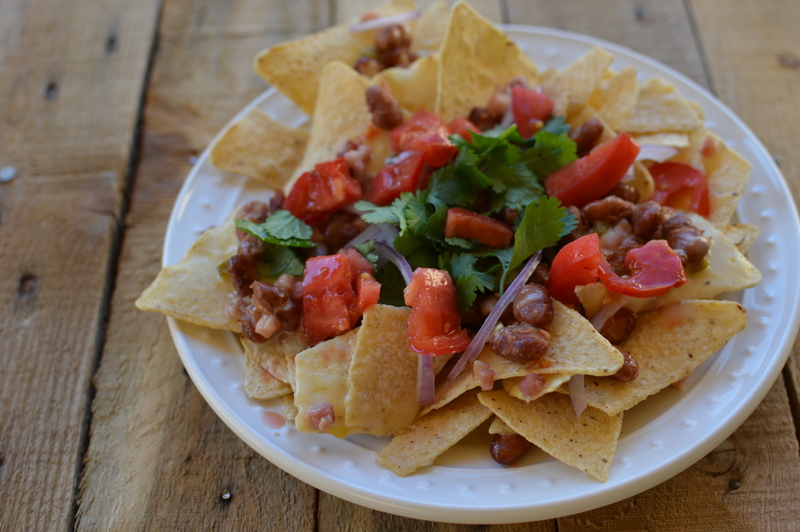 Sprinkle ham and beans over the warm tortilla chips. Drizzle cheese sauce over the chips, beans, and ham. Top with fresh red onion, tomato, and cilantro. *By posting this recipe I am entering a recipe challenge sponsored by Cabot Creamery and am eligible to win prizes associated with the contest. I was not compensated for my time.